Each year, TAIS’ Anijam features 10 second long animated films submitted under a theme, which are compiled and screened at the TAIS Annual Animation Showcase. PRIZE FOR BEST ANIJAM – For the second year, the Showcase Jury’s pick for Best Anijam will be awarded a cash prize and in-kind studio use toward production of a short animated project for presentation at TAIS Showcase in 2019. TAIS invites artists to submit to our 2019 High Tension Anijam competition! We’re looking for 10 second-long mash-up masterpieces, creative never-before-seen combos, or unique universes populated by well-known characters. Bearing in mind the rules of ‘fair dealing’ in Canadian copyright law, artists are required to submit only their own original animated work. Do not combine or otherwise edit together visual material you have not explicitly created. Artists are encouraged to consider parody, satire, and issues of appropriation, when using existing fictional or non-fictional characters. Most importantly, artists are encouraged to have fun with the 10-second format and narrative challenge! The 2019 TAIS Animation Showcase and Anijam is scheduled for July 20, 2019. QUESTIONS? Contact Mariam Zaidi, TAIS Managing Director – mariam@tais.ca. Any frame-by-frame or computer-assisted animated film or video completed with the theme: High Tension. Films MUST be 10 seconds in length with sound or without sound. Artists may only submit only 1 (one) Anijam per competition. Film must be submitted by June 23, 2019 (before midnight). The person(s) submitting the film must either be the creator of the film or have express permission to submit it. The creator(s) of the film must have the rights or express permission to all materials used in the film, in accordance with Canadian fair dealing copyright law. Works submitted must be in Quick Time file format, sized at 1920 x 1080 / codec Prores or H264 sound 48hz. Entries can be made by providing us a link for download, or by sending us a QuickTime movie in the required format on a USB stick. One 1920 x 1080 JPG or PNG still image from the Anijam. All materials must be submitted by June 23, 2019 (before midnight) or it will not be considered. A copy of all selected Anijam works are kept within TAIS Library for research purposes. The films submitted will be compiled into one sequence and screened at the 2019 TAIS Animation Showcase and on TAIS’ Youtube channel and/or Vimeo channel. TAIS prioritizes the payment of artist fees. Anijam artists will be paid a screening fee for the presentation of their work at the 12th Annual TAIS Animation Showcase. All fees will be remitted in Canadian dollars. Best Anijam awards will be granted by the 2019 Showcase Jury, and via an audience choice award. The 2019 Showcase Jury’s pick for Best Anijam will be awarded a cash prize and in-kind studio use toward production of a short animated project for presentation at TAIS Showcase in 2020. Prize details forthcoming. 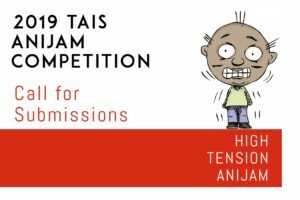 By submitting a film or films for the 2019 TAIS Anijam, the participant accepts without reservation the terms of the present regulations as stated in this document.